As a 3RBA member, our partnership with the NGLCC, the National LGBT Chamber of Commerce, gives you access to the many programs and benefits available through the NGLCC. 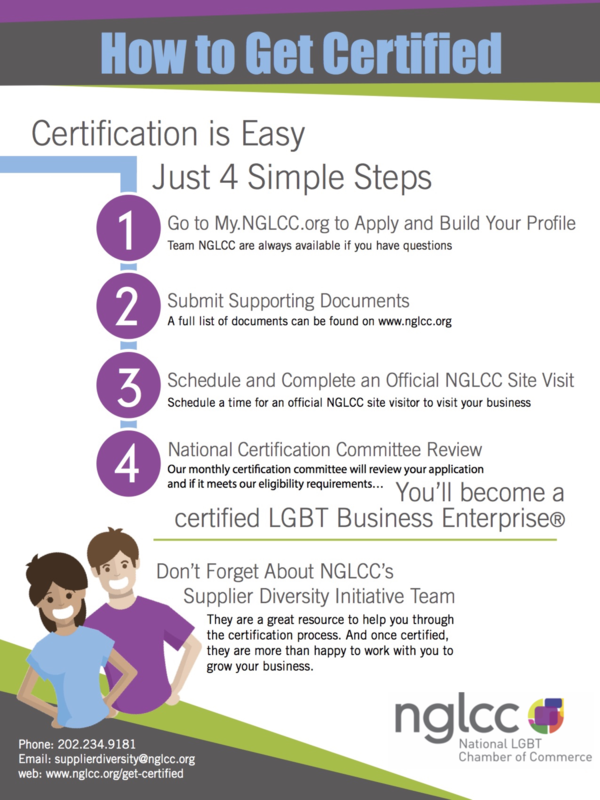 One of the most important benefits of our partnership with the NGLCC is your ability to take advantage of the NGLCC Certification Program – the NGLCC is the exclusive, third-party certification body that verifies that eligible businesses are majority-owned by LGBT individuals, and subsequently grants LGBT Business Enterprise® (LGBTBE®) designation to such businesses as part of its LGBT Supplier Diversity Initiative. Access 3RBA and NGLCC corporate matchmaking and networking events throughout the year. Ensure your 3RBA Membership is in good standing to receive membership benefit waiving the full certification fee (a $500 value at no cost to you! ).